Children learn through play. Its their job. They should have ample opportunity to play throughout the day. Play can be indoor or it can be outdoor. Both are important. 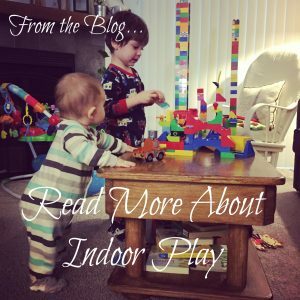 Indoor play can be guided through activities like puzzles, games, or activity boxes that you create for them. You can can engage with them in the activity discussing and teaching as you go. Sometimes you will be the engaging with them as they pretend play (restaurant, school, doctor, etc) or as they build a lego community filled with buildings, cars, and trains. You may lead but soon they will learn to lead. Or you may just play side by side letting your creativity work together. 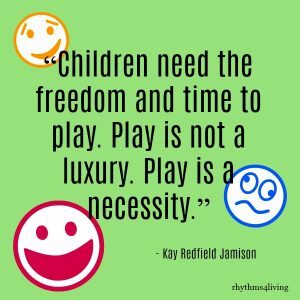 Play can also be independent. Its important for children to learn to play independently. Give your kids a bucket of play dough and play dough tools or a big bin of legos and let them get creative. The independent play is good for them but its also good for you as a parent. I believe its important to set boundaries and make expectations clear. For instance, when I need to work on something, whether its dinner or my website, or need to just lay on the couch and close my eyes for 15 minutes, I need my son to sit and play on his own. I state that I am taking time for myself and my self care and I encourage him that he is able to play on his own and that I am right there with him even though I am not engaging in his activity. Of course some kids are naturally independent and do not need any encouraging, but if your child needs some encouraging, that’s okay.